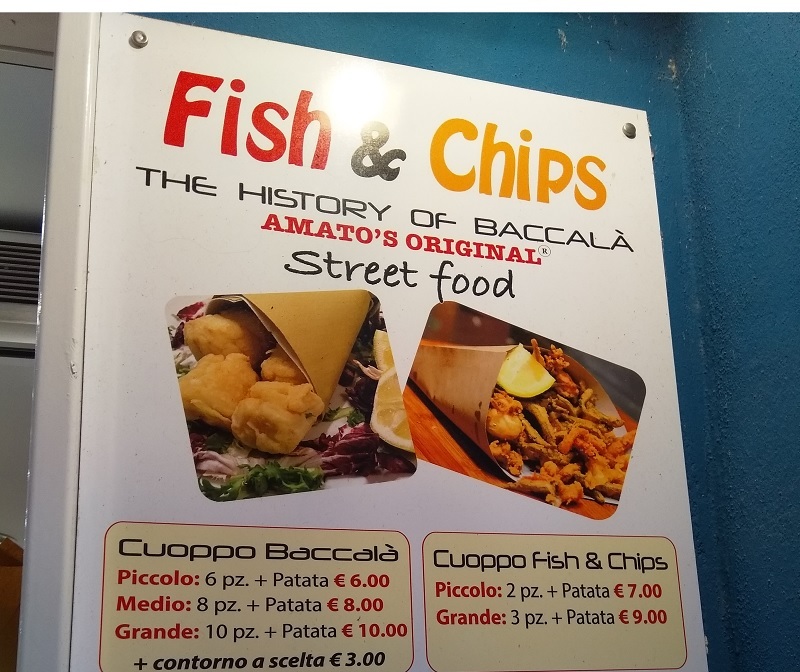 You can buy fish and chips in Naples, but it’s not like British fish and chips. It’s not better, nor is it worse. It’s just different. I tried this Italian version of fish and chips for the first time earlier today. Fish and chips is considered a typical British food. Although I’m far from being a true-blue Brit, I like fish and chips and get curious every time I see versions of fish and chips available in other countries. When I lived in the Netherlands I discovered a few places that sell fish and chips, but although the fish is similar the chips are never right. They are more like the chips you get in a British restaurant that has fish and chips on the menu. Nothing like the chips you get from a British “chippy”. That’s not to say Dutch chips aren’t nice. They’re actually exceptionally good. When I say they are different from those served in a British chippy is not a criticism. It’s only a statement of fact. Chips from a British chippy would not work at all in a Dutch Friet Speciaal, but put them with chip shop fish and they become something very special indeed. 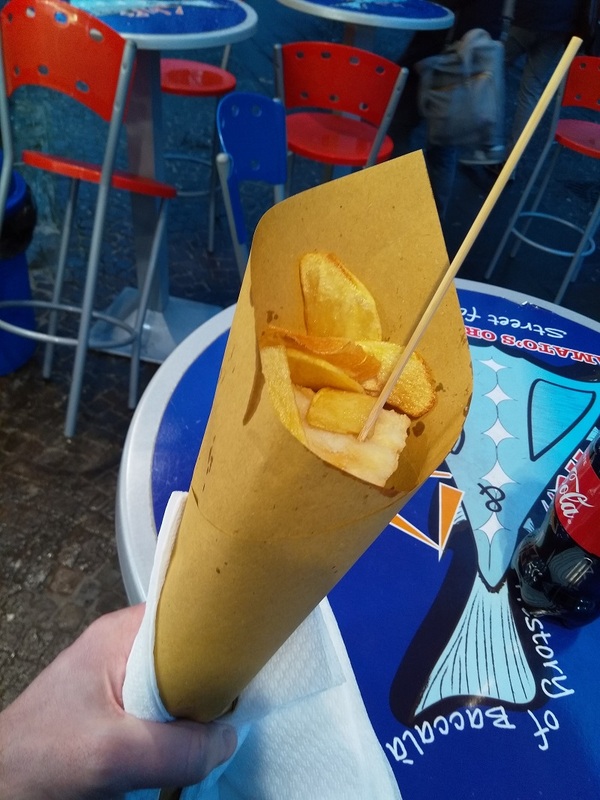 The fish and chips in Naples are served in a paper cone. They use two types of fish. I chose the cod because it was slightly thicker than the other option. The cod is not battered but it appears to be lightly coated in flour and it’s chopped into small chunks before being cooked. I ordered the small option (piccolo) that contains six chunks of cod. The cone contains more cod than chips and the chips are very thin. More like crisps, in fact. The other difference is you eat this Italian version of fish and chips with a long wooden skewer. As for the flavour, I can’t fault it. The fish I ate tasted very fresh, but Naples is next to the sea so that’s probably not so surprising. The chips were good too. It was just the width that came as a surprise.